I'm certain my kids are gonna need counseling for this one. I'm also pretty sure it gets us fairly close to winning the "Parents of the Year" award. Today, my husband hit a bird on his way to work. 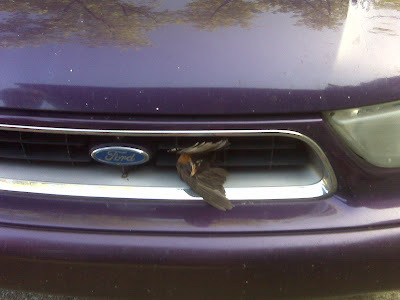 When he got out, he noticed the bird was STUCK ON the grill of OUR CAR!!! Did he take the bird OFF? He went into work, and forgot about the bird. Then he came home, and our children ran outside to play for a bit before dinner. Yes, children. Your father murdered the bird and LEFT ITS CARCASS THERE for your eyes to see. We know we're spectacular parents. You can send the counseling bill to us. That's NOT "Finger lickin' good" But it is Oh so something my dh would do....I was the one who had to take the car through the carwash 3 times after he hit a dog that jumped out in front of us on a very crowded 2 lane highway...as in nowhere to go to avoid dog w/o causing a HUGE accident...with all of us in the car.